The gothic has always been the cornerstone and mainstay of horror film: that place that is supposed to be the most secure and welcoming - one's home - is suddenly dangerous and uninviting. Irish director Brian O'Malley (Let Us Prey) returns to these horror roots for an update on gothic tropes with a healthy infusion of social-historic drama. Twin siblings Rachel (Charlotte Vega) and Edward (Bill Milner) live in an isolated mansion in the Irish countryside (the ancestral home of their English forebearers who arrived from the UK). They have to follow certain rules in order to keep strange monsters at bay. Reaching their 18th birthday, Rachel starts to chafe against this confinement; on top of this, their solicitor Bermingham (David Bradley) says they are out of money and must sell the house, and a neighbour recently returned from World War I, Sean, (Eugene Simon) is enamoured of Rachel. But the monsters inside seem determined to keep the twins to the house and their apparently inevitable, deadly fate. The house, while in archietectural design fits into the gothic mode, in interior is given a feeling of the gothic horror replayed out too many times. This is a house too long left to be haunted: crumbling walls with peeling paint, layers of dust on the furniture, dirty windows (if they are ever even uncurtained). O'Malley and production designer Joe Fallover give us this weary house, with its weary inhabitants, as the result of the gothic horror as much as the cause, one that fights its demise as it attempts to overruun its inhabitants. Cinematographer Richard Kendrick, who also worked on Let Us Prey, again finds a rhythm with O'Malley in evoking this perpetual cycle of death and decay. The shots are crisp ad cold, with blues and browns in focused, blacks that are pitched to the darkest corners of fear, and shadow in which we know bad things are lurking. And as with Let Us Prey, O'Malley doesn't just keep the larger social and historical factors in the shadows. Rachel and Edward are descendents of English invaders (and they still speak with English, as oppose to Irish, accents); not only are they isolated geographically, but socially as well, freaks both in personality and nationality. Sean is also seen as an outsider, having fought in a war viewed by the Irish as one that did not concern them, with Sean fighting for the enemy. But it is Rachel who bears the brunt of it, trying to understand her own identity as a intelligent woman in a culture still not acknowledging any women with agency, especially over her body. Rachel is really at the heart of the story, and Vega does a tremendous job of conveying both the burdens that Rachel carries as the (slightly) elder sibling who does most of the day-to-day work of keeping herself and Edward alive, as well as understanding her own agency and attempting to find a life outside of her home, which would mean just staying alive. Unfortunately, the character of Edward falls a bit too far into predictabiltiy in his obsession with his sister, and constantly moping around the house, that in the end it's more out of disinterest than anger that the audience might not care about what happens to him. 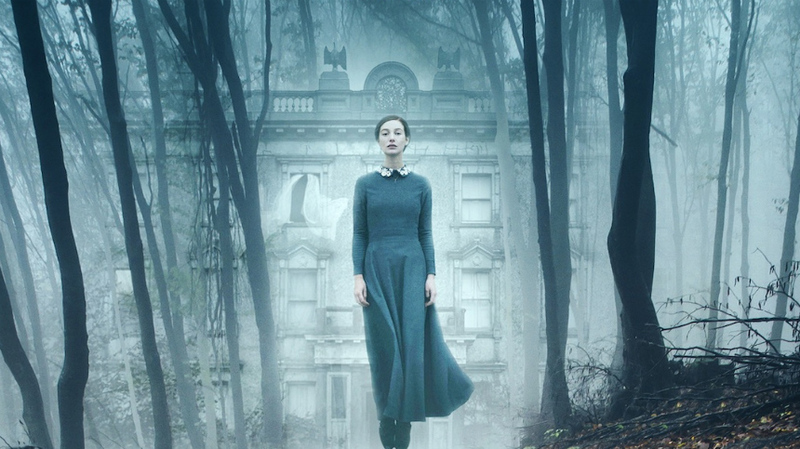 O'Malley gives us some classic scares in The Lodgers, along with a heroine worth rooting for and a gothic house as world-weary as it is frightening. While the intent of the fearsome creatures is a little on-the-nose, the atmosphere created is creepy enough to get deep under your skin. The Lodgers opens in limited theatrical release in the USA and on VOD on Friday, February 23rd.